In the same way one can rely on Rush to release a DVD after every tour, so too do Transatlantic; all I can say is thank goodness for that because we get to relive some quite extraordinary musical moments. That's not to say it's all impeccable; the Roine Stolt/Neal Morse guitar duet I could live without; funnily enough I recall it more favourably from when I saw the London show, I wonder if they changed it? Some of the vocals are a little rough around the edges too, not surprising given that Morse was struck down with a heavy cold on the day of the shoot. That said, he does a remarkable job in the circumstances and gives it his all. On the plus side it does mean this is an honest and faithful recording and not one that has been "fixed" or "tweaked" in the studio. 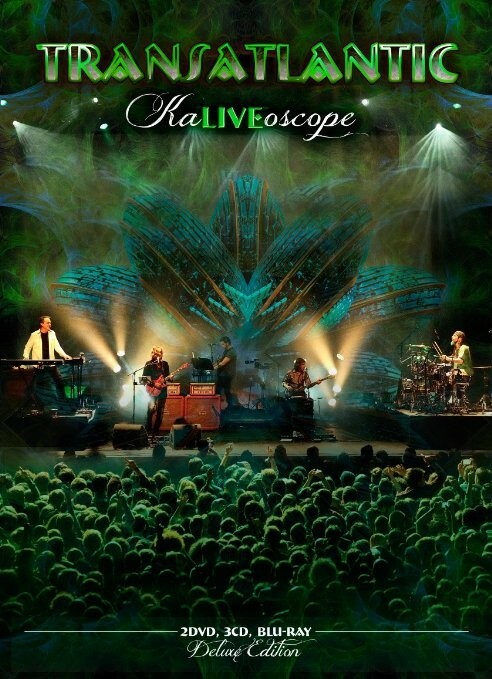 Expansively filmed in Cologne using multiple cameras and angles, this is an excellent package that shows a group of supreme musicians delivering the goods and clearly enjoying the experience. The deluxe version comprises of 3CD, 2DVD and a Blu-Ray extravaganza which includes a lengthy tour documentary, band and individual interviews. The tour documentary certainly conveys the highs and lows of life on the road, including the revelation of Morse's cold and a scary moment when one of their flights on the first leg of the tour was aborted mid-takeoff. It was strange seeing the band perform in daylight on the Progressive Nation cruise. The footage of the band with Jon Anderson will be of interest to many. Clearly this was a career highlight for Portnoy who claims that evening's show to be one of his favourite three gigs... ever. Back to the main DVD and although Ted Leonard was a hired hand he's not treated as such; he takes the limelight several times during the set with both vocals and guitar, not bad for a guy who initially declined the gig as the set was too complex to learn at just a couple of weeks notice. He needn't have worried. All of the 'Kaleidoscope' album tracks appear alongside a 'Whirlwind' medley and choice selections from their earlier albums, which even the pickiest of punters would be hard pressed to complain about. Portnoy is his usual effusive self as he urges the fans to clap and sing; it has to be said they didn't need much encouragement as they relished proceedings too. As always the band believe in value for money so as well as a three hour show there are plenty of extras including excellent bonus songs filmed at Tilburg with Thijs van Leer (Focus). Just superb!